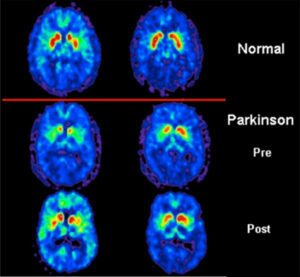 Parkinson disease is a movement disorder that results in a reduction of dopamine (a neurotransmitter). Parkinson disease occurs over the course of several decades and displays differently in each person impacted by the disease. Many people believe that all people with Parkinson’s have a tremor. In fact, 25% of people with Parkinson’s have no tremor. There are distinguishing characteristics that a physician evaluates to determine if a person has Parkinson’s. Many people with Parkinson’s experience a loss of smell and constipation up to a decade or more before diagnosis. At the time a person is likely to go to a physician for evaluation, they often report experiencing stiffness, rigidity, balance issues, possible tremor and slowness of movement. In addition to the symptoms above, people with Parkinson’s also experience slower thinking and processing, sleep disturbances and more. Because each person has their own unique symptoms, it is important to see a physician to effectively evaluate if you have Parkinson’s. There are a variety of special medications that are available for people with Parkinson’s. The medications will assist with reduction of symptoms. Medication addresses the decline in dopamine and the impact of dopamine reduction in the body. Each person will need their own tailored medication plan to address their symptoms. In addition to medications, surgical options may also be an option for people with Parkinson’s. What should I do if I think I might have Parkinson’s? It is important to receive an evaluation from a movement disorder physician. Movement disorder physicians are neurologists who have advanced training in movement disorders. Dr. Samanta and Dr. Ospina are movement disorder neurologists. An evaluation with a physician from our practice will ensure an accurate diagnosis and specialized treatment plan. Contact us today to make an appointment.